Join Host Alan Seltzer Saturday night at 7 PM when he kicks off Long island Restaurant Week with an hour of songs about food. The event, beginning Sunday, offers eight days of deals at over 150 restaurants. An Under the Covers segment will feature alternate versions of some of those hits. For dessert, The Grooveyard Top Ten will offer the biggest hits of April 21, 1959. There’s also time for your requests and dedications during our Grooveyard Party Hour. 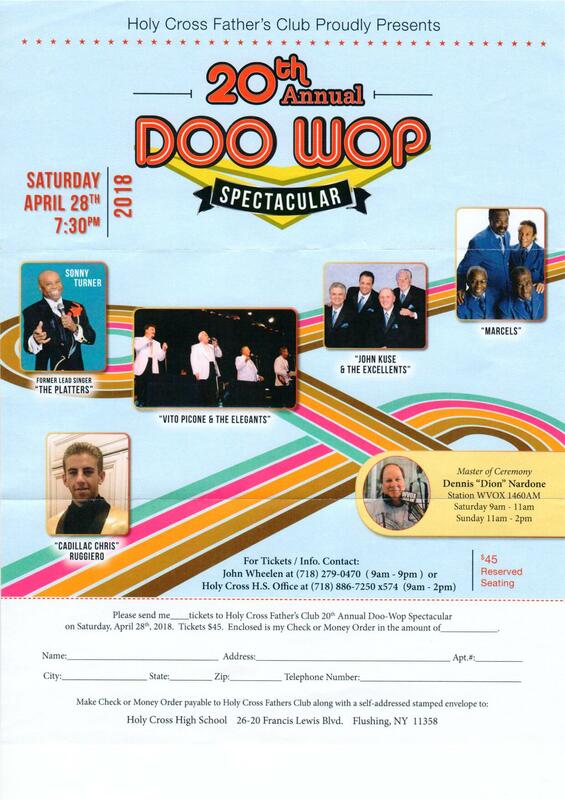 Tickets are still available for the 20th Anniversary Doo Wop Spectacular at Holy Cross High School. The April 28th show features Sonny Turner of the Platters, Vito Picone and the Elegants, John Kuse and the Excellents, The Marcels and “Cadillac Chris” Ruggiero. Tickets are available by calling John Whelan at 718-279-0470 or the Holy Cross High School Box Office at 718-886-7250 ext. 574.